Note: this book was previously released as Stop Dating the Church. 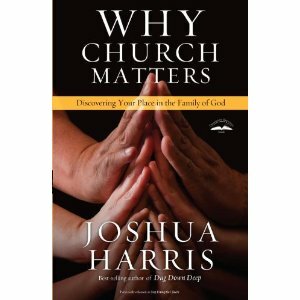 I was asked if I would like to read a copy of Why Church Matters : Discovering Your Place in the Family of God and I said yes for arrogant reasons. I was positive I would agree with the message of the book (I did) and would like the tone of it (I did) and that it would be relevant to a large majority of people (I believe so.) What I didn't bank on was that I would sit down to read it entirely for myself because I needed an attitude adjustment. Here we embark on one of those honestly painful posts that I rather hate. I'd much rather read and talk about a book that I think probably applies to you more than it does to me. (Ahem.) Those are more fun. But that's not what I must do now, is it? I was honestly surprised by my attitude which caused me to need to read this book. You see, the fact of the matter was, I was really feeling very down on church and very up on "going it alone." It's not my church's fault. It's my fault sinful attitude. Part of it is the season of life I'm in. Hauling three little children to church and teaching them how to sit faithfully through the service is not really my idea of a wild and crazy good time. Especially not when the littlest one wakes up from her morning nap right before church and is therefore interested in sharing her (very loud) opinions with the whole wide world all during the service. (I'm not saying whose daughter she is in those moments.) Yes, I know there is a nursery option but we have personal convictions about teaching our children to be a part of the service with us. (See my thoughts: Parenting in the Pew) Did I say that was an easy conviction to have? Well, it isn't. Especially when the child is babbling a mile a minute. But it's a conviction nonetheless and I recite to myself the following mantra: "This is only a season, a season, a season, a season..."
Despite my convictions and personal recitations, I had developed a very bad attitude about going to church. Honestly, I get tons more out of staying home and listening to worship music that I like and quietly spending time in scriptures myself. Individual worship. I like it! But when it came to corporate worship? As I said, I needed an attitude adjustment and I got one with Why Church Matters . Why should we love the church? Because it is a God ordained and instituted establishment and because He loved it enough to die for it. If He loves it that much, shouldn't we? * Discipline is the process that removes a person from the church who is acting and living in ways that contradict New Testament teaching for godly living. In order to most helpfully love the person in unrepentant sin,and so as not to confuse others as to what it means to be a Christian, church leadership lovingly puts them out of the church the hope they'll be restored (see Matthew 18 and 1 Corinthians 5:1-9)." On this note (har, har) I recognize that there are a great many opinions out there on what constitutes Biblical worship. Hymns? Modern? Hymn books? Projection screens? We can argue about this for a long time. I have my own opinions. But what I was re-reminded of in reading this book was that it's not about my opinion, what I like and what I particularly connect to. It's about the worship of God and He specifically tells us to gather together (Hebrews 10:25) and worship Him. "Another part of the Christian life that flourishes in community is worship. Again, this is something we can also enjoy by ourselves. We can worship anytime, anywhere, and in complete solitude. But something unique and irreplaceable happens when we worship together. The New Testament captures this double truth when it pictures both individual believers and the family of believers as His temple. You and I are a temple of the Holy Spirit (1 Corinthians 6:19). Yet in the same letter, Paul describes churches as being part of "God's building" (3:9). And when we come together to worship corporately, we respond to God - and He reveals Himself to us - in different ways. In short, I cannot and should not and am not commanded to go it alone. Notwithstanding Baby Talk, wiggly two year olds, and my faulty emotions which sometimes fail to "engage." Instead of pulling away from the Body (dangerous) I should repent for my sinful thoughts and go where God has called me to go -- to church, to be with His bride. May it be so in my own life. Not always because I want it to be so, but because it needs to be so. Thanks to Waterbrook Multnomah Publishing for sending a copy of this book. All opinions expressed above are entirely my own and are directly entirely at myself. Sounds like a great read. It seems no matter how much I know the value of being a part of the church, and have even written posts about it, I still often would rather stay home. I'm in a different season of life -- I've always been a homebody, but the older I get the less I want to go through the fuss and bother of getting ready to go much of anywhere, especially now when there are good sermons available online. But knowing church is valuable to God keeps me going, and I am often blessed. Wow!! You have no idea how much I needed this post RIGHT NOW! Well, I guess you do. ;) Thank you!!!!!! Needed post...for me...sounds like a worthy read...even if I haven't been to church in 3 weeks because of baby! I think I need to read this one, too. Sounds like a good one -- and here's one more comment to testify that such a book is always timely. I love your honesty, Carrie. Great thoughts! I'll add this to my "to-read" too. Yet another! You sound like my mom with the keeping everyone in church thing. I think that's awesome although it seems insanely hard. I really respect you for that though. I had a friend who led the youth group at her church and she told me that if the youth group was being "bad" they weren't allowed to have their own service. They were made to go to the actual church service. Youth group! Teenagers! Punished by having to sit through a service! I was stunned. I know WPC doesn't mean for nursery to continue forever, but I think it's important to keep the children in the service as much as we can. I'm glad to hear you feel that way! We hold similar opinions on parenting in the pew, although we use the nursery option until 3 years old. At 3 they join us for the music and then go to nursery for a Sunday school type lesson (or church doesn't have Sunday school for kids). At 5 they stay with us for the entire service. Which is why I didn't go to church today. My hubby has to work all day (it's a disaster recovery test and very important in IT for a bank!). And my 3 yr old has been having separation issues for the last month. There's NO way he would sit through our pastor's 45 minute sermons and I can't leave a 5, 6, and 8 yr olds alone in the service. So we're home. Cleaning house and playing computer games. It's been nice. :) And all of that has nothing to do with your book review but I felt like sharing. ha!ha!